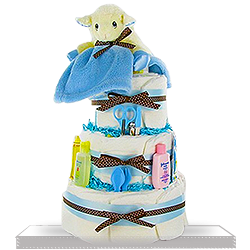 Plenty for Two 3-Tiered Diaper Cake Deluxe! 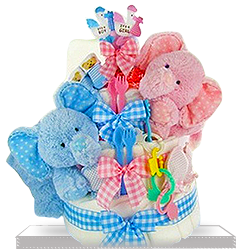 Two plush elephants in either pink or blue flock this 3-tiered diaper cake that contains 60 disposable diapers! Those will come in handy! 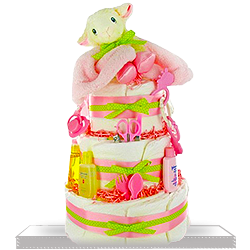 This lovely cake is decorated with 2 fork & spoon sets, 2 burp cloths, 2 pairs of scratch mittens, and 2 pairs of booties. 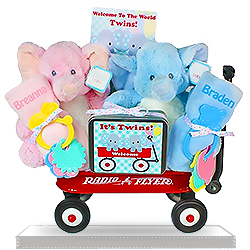 Link toys finish off this great gift idea! We were really happy with the gift. it's awesome!!! great selection and presentation. 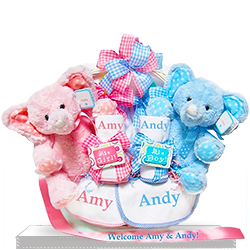 Lovely arranged gift set with everything that is required to satisfy newly-made parents of twins! Delivered on time, came in perfect condition and looked exactly as in the picture! 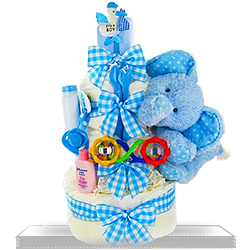 Before reading the details I thought that diaper cakes don’t have so many items as gift baskets but when I compared the features of this gift with other proposals for twin babies I noticed that it is rich enough with other cute and useful items but it also has diapers. 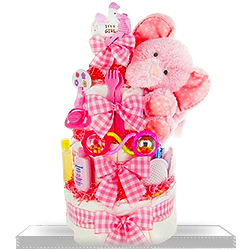 I ordered this gift and I guess it was right choice because receiver was in seventh heaven when got it. 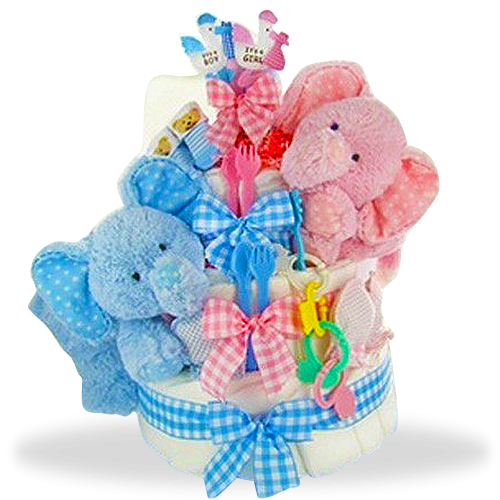 I chose this gift for my relatives’ baby shower because it not only looks cute and worthy, it’s also useful!